WASHINGTON -- Capitol Police shot a man on Monday after he pulled a weapon at a U.S. Capitol checkpoint. The suspect was taken to a local hospital and a female bystander sustained non-life-threatening injuries. The U.S. Capitol was on lockdown for about an hour and the White House also was briefly locked down. 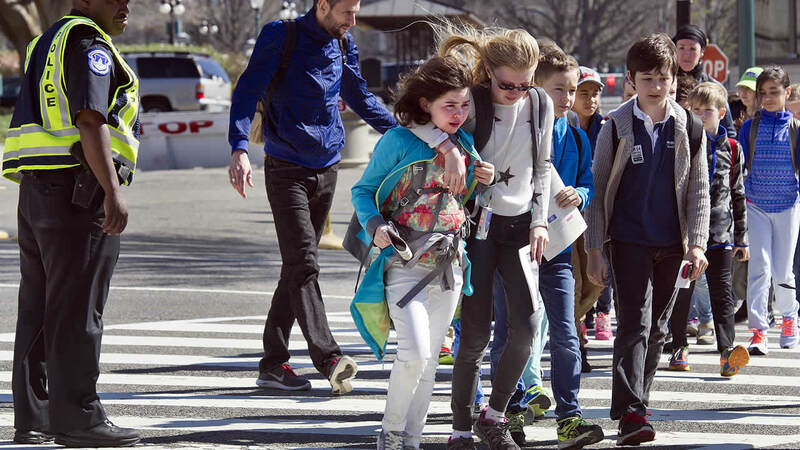 As Washington teemed with spring tourists in town to view the cherry blossoms, staff members and visitors to the Capitol were rushed into offices and told to shelter in place. The suspect was known to officers, Capitol Chief of Police Matthew R. Verderosa told reporters. However, he would not confirm reports that it was the same man who disrupted the House chamber last fall by shouting. That man, Larry Dawson, was issued a "stay away order" by D.C. Superior Court in October, ordering him to keep away from the Capitol grounds, court documents show. The event unfolded with Congress on recess and lawmakers back in their districts. "We do believe this is an act of a single person who has frequented the Capitol grounds before and there is no reason to believe that this is anything more than a criminal act," Verderosa said. Initial reports said a police officer was injured but they proved erroneous. Capitol office buildings and the Capitol itself were re-opened for business about an hour after the initial reports of gunfire. The Visitors Center where the shooting occurred remained closed as the incident was being investigated. Visitors were being turned away from the Capitol as emergency vehicles flooded the street and the plaza on the building's eastern side. Police, some carrying long guns, cordoned off the streets immediately around the building, which were thick with tourists. Amanda Smith of Columbus, Ohio, said she and her family were touring the Capitol and were in the Senate visitors' gallery when she heard police officers' radios start talking about shots being fired. "Sure, we were worried," she said. "But there were lots of kids around so we didn't make too big a deal of it." Smith was visiting with her husband, William, and children Ian, 9, and Evan, 4.